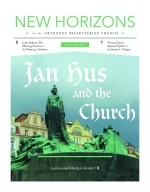 In a day and age when people easily dismiss the church as unnecessary, Jan Hus stands in stark contrast. Hus was a staunch defender of Christ’s church, both in proclaiming her importance and in protecting her from enemies within and without. On July 6, 1415, Hus was burned at the stake for his convictions. This year we celebrate the 600th anniversary of his death. On August 1, Orthodox Presbyterian minister and chairman of the Special Committee on the Psalter-Hymnal, the Rev. Dr. Alan D. Strange, and United Reformed Churches in North America (URCNA) minister and chairman of the URCNA Psalter Hymnal Committee, the Rev. Derrick Vander Meulen, officially began their labor as coeditors of the proposed Trinity Psalter-Hymnal. Earlier in April, an agreement between a commission of the Committee on Christian Education (CCE) and representatives of both the URCNA trustees and the URCNA Psalter Hymnal Committee, had been reached that Dr. Strange and Mr. Vander Meulen would serve in this role. Orthodox Presbyterians from at least sixty-five congregations showed that summertime is for more than just riding the waves. More than five hundred members of the OPC gave heartfelt service on different short-term mission trips, including sharing their faith through vacation Bible schools, English classes, evangelism on boardwalks, and repairing church buildings and members’ homes.